Data released by the Australian Bureau of Statistics shows the proportion of Australians living in apartments, townhouses, and separate houses is on the rise. The data showed that 13.6% of the population lives in flats, units or apartments, and 9.9% lives in a semi-detached terraces or town houses. And, with the number of Australians moving into highrise apartments continuing to grow, it’s safe to say that small homes are going to become an increasingly important part of the housing landscape across Australia. One of the major problems with having a small home is – you guessed it – space. Where did it all go? And how can you reclaim it back? Luckily, there are some really innovative storage solutions to help you solve this problem and maximise the space you do have available. 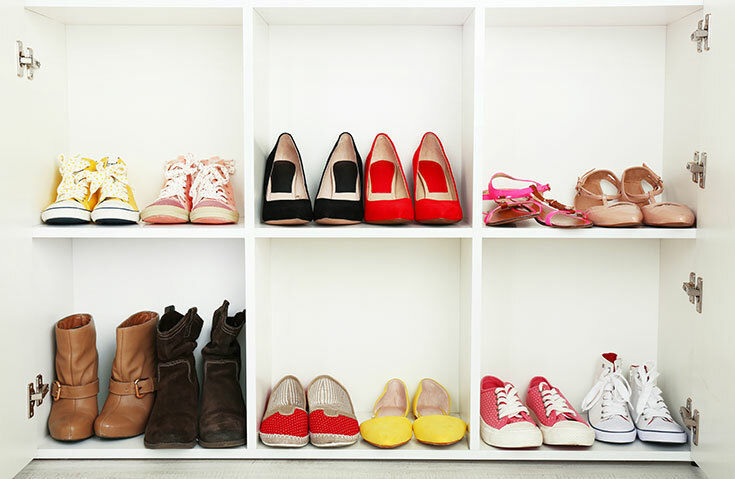 Here, we bring you the best five storage hacks for small homes. Multifunctional furniture is one of the most innovative storage solutions for any space. A shelf can also be a bed, a lounge may double as a bookshelf, and modular furniture can be pulled apart or pieced together according to your needs. These pieces do often come at a cost but, If your budget is tight, remember you are actually getting two, three, or maybe even four functions out of each piece of furniture. This will help keep your home tidy, and free up some much needed space. Do your research and see what suits your lifestyle as well. For example, if you don’t want to have to downsize your bed – don’t! Why not make space around your bed instead? Consider getting a full length mirror that can be flipped over and transformed into an ironing board in one swift motion, or the hanging bike shelf that stores your bike off the floor, and doubles as a bookshelf. This solution is particularly handy if you’ve got some narrow nooks and crannies in your kitchen that aren’t being put to good use. Next time you’re in the kitchen, have a look around and see all the spaces that aren’t being used. Some of them might not be viable for this project but don’t worry – there will definitely be some that are. For example, this DIY pantry shelf uses the space beside the fridge to create a practical storage solution to store canned goods, sauces, spices, or anything else you might want. 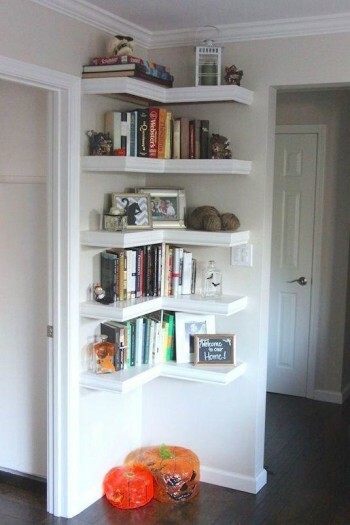 If DIY isn’t your thing, you can purchase pre-made shelving from various outlets. Sliding shelves inside your existing pantry are also a great option for maximising space utility in small kitchens. They are perfect for freeing up space inside the pantry, and can help you organise your spices and ingredients in easy reach for while you’re cooking. Tables can waste a lot of space in a small home, especially when they’re not in use. A fold down table is perfect alternative to small coffee tables, sewing tables, kids play tables and office desks. Depending on the size of your home, the design could even be applied to a dining room table. Fold down tables can be installed into a shallow wall recess or, if that’s not possible, a slim wall cupboard can be attached to the exterior. Once ready, all you need to do is pull the structure down and voila! You’ve got an instant table. When it’s time to free up some space simply fold it back into the wall. This project is DIY friendly, however there are many professional options to choose from as well. Empty corners are often overlooked when trying to find nifty storage solutions. Yet, they are the perfect place to add some handy shelving. From the bathroom to the bedroom, floating corner shelves will give you somewhere to store all your bits and bobs including books, makeup, shampoo, ornaments and photo frames. If you have the right materials and tools, these shelves can be installed with a quick and simple DIY job. For particularly tricky corners, think about hiring a professional to create customised shelves that meet the space’s needs and constraints. Remember, be mindful when installing any shelves to make sure they won’t become a hazard to someone walking by. Ensure they aren’t sticking out too far or installed in ‘blind spots’. If you live in a small home, doors are a space you definitely must capitalise on. If you are a little unsure about this concept, think of doors as walls and you will start to see storage solutions at every entrance. For example, a kitchen cupboard door could become a spice rack or hold a bin; the bathroom door could become a towel rack; and the bedroom door a shoe organiser. Just remember, the door has to be able to open and close without difficulty. Ensure you measure the depth of a cabinet or cupboard before installing storage on the inside of the door. For doors into bedrooms or bathrooms, make sure you don’t prevent the door from opening properly – you still need to be able to get in and out of the room easily.